Special Version High Production Machine that can move automatically in both X and Y axis for automatic honing offset cylinder blocks and parts. This feature allows use of optional programmable roll over fixture to be able to hone a complete V block automatically – unattended! Includes feature to drain coolant out of block at end of cycle.Automatic Lower Crash Protection System Many Engine Blocks have interference in the lower area of the bores and can damage honing stones and holders. Everytime the H87X starts honing a cylinder, the machine will check bores for interference avoiding potential damage to honing stones and holders. Variances in lower bores are common. Rottler H87X Control senses lower bore interference prior torotation and stroking stroking motion starting at full power, eliminating any stone or holder damage. Special Heavy Duty Version High Production Machine that can move automatically in both X and Y axis for automatic honing offset cylinder blocks. Automatic Lower Crash Protection System – every time cycle start is activated, the machine will check that the stones will not interfere with lower bore before starting rotation and stroking preventing stone and stone holder damage. 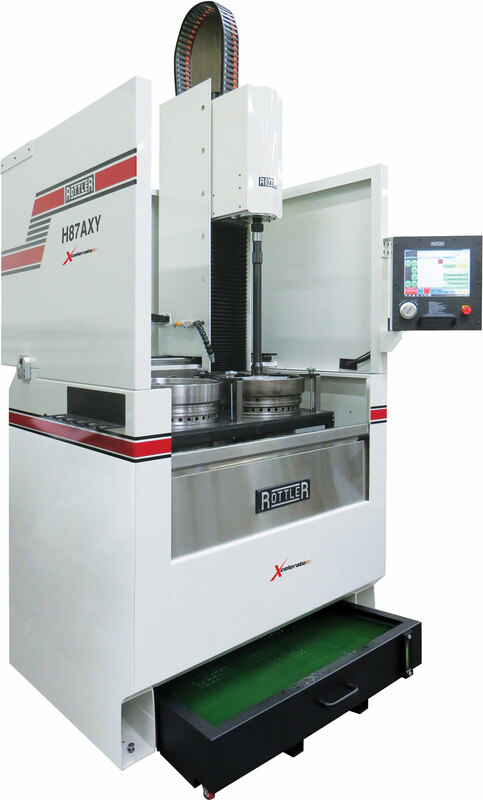 Automatic Honing Stone retract at End of Cycle – the machine will automatically retract the stones during last stroke so that the stones do not leave any scratches or marks in the bore. Automatic Cross Hatch Angle System – the machine will automatically adjust parameters to programmed cross hatch angle and finish the bore to programmed angle. Automatic Roughing and Finishing Load Sensing System - machine controls load/pressure that the honing stones exert against the cylinder wall and reduces load during finishing cycle. Automatic Short Stroke and Dwell - machine detects tight area and short stroke or dwells. Automatic Plateau Finish Program - the machine automatically expands plateau stones/brushes to programmed load and counts down number of plateau strokes, then withdraws the stones/brushes and retracts the hone head to the clearance position. Horizontal Movement (Y Axis) Front and Back Direction - 5" (127mm) - movement is on linear slideways and is powered by servo motor. Vertical Movement (Z Axis) Up and Down - 40" (1016mm) - movement is on linear slideways and is powered by servo motor. Special version machine with increased stroke length is available - price on application. Lifetime Magnetic Canister Filter System includes tools for cleaning filter. Rottler Software is designed with Simplicity in mind. Conversational software allows operators to quickly and easily learn and create their own programs. It takes only a few minutes to create a new program for a new block then it is saved for future recall and use.